Leeds-based specialist property group, the Priestley Group, has invested £1.2m in its new Elland Road head office. An extensive refurbishment programme was carried out by the Group’s construction arm, Priestley Construction, including a new glass atrium extension. Priestley Lettings, a lettings agent with offices in Leeds and Bradford. Priestley Group purchased the three-storey site, which is located within two miles of Leeds city centre, in November 2017 from the Shepherd Building Group. Priestley Lettings has located its Leeds city centre office to the entire ground floor of the new head offices, with Priestley Homes and Priestley Construction occupying floors two and three. The new head office is designed to meet the needs of the Group’s expanding team, which currently includes 106 employees following a raft of recent senior appointments and is expected to grow to 300 by 2021. 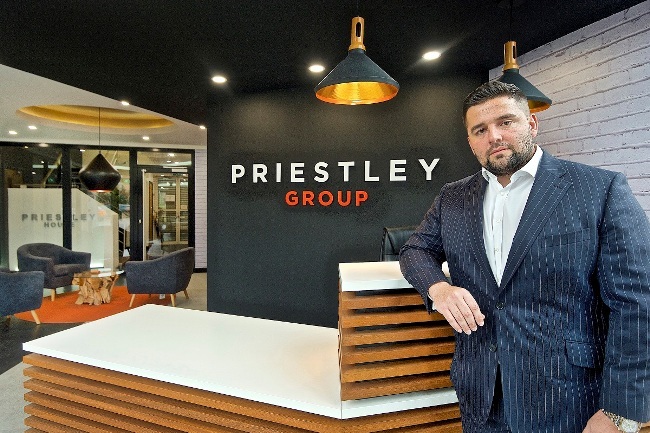 Nathan Priestley, founder and chief executive officer of the Priestley Group, said: “We have always called Yorkshire our home and this significant investment into new premises reaffirms our strong connection to Leeds and the region. “We are at a really exciting time in the business; our development pipeline is the largest it’s been in the company’s history, with over 700 homes being delivered across 20 major developments. “These schemes are instrumental in helping us to achieve a record £32m turnover in 2018, a figure which we project will more than double to £68m in 2019.